That question had us scratching our heads as well, so in the exhibition’s text panels we fudged. But I recently came across a letter by Rabbi Lazaron that may shed light on the matter. First, a little background, primarily drawn from “The Jewish Problem in U.S. Medical Education, 1920-1955,” by Dr. Edward Halperin, the most authoritative history of the quota system that discriminated against would-be Jewish doctors (excerpt here https://muse.jhu.edu/article/15241/pdf ). This article, published in 2001 by the Journal of the History of Medicine, also alerted us to the role played by Baltimore Hebrew Congregation’s Rabbi Morris Lazaron in documenting the quota system in 1934. Rabbi Lazaron’s papers, held by the American Jewish Archives in Cincinnati, which supplied us with hundreds of pages related to his study, and an unpublished thesis by Scott L. Shpeen (A Man Against the Wind: A Biographical Study of Rabbi Morris S. Lazaron, 1984), a copy of which is in the vertical files at the JMM, are the other major sources of information for this post. Antisemitism in the United States increased throughout the early 20th century as approximately two million Jews came to America, mostly from Eastern and Central Europe. By the time the flow of immigrants was staunched by legislation in 1924, the American-born children of these arrivals were seeking to enter college in large numbers, and “overt anti-Jewish prejudice in the academic community…reached its zenith.” Harvard College president Lawrence Lowell started the ball rolling around 1922 when he suggested that “if every college in the country would take a limited proportion of Jews we should go a long way toward eliminating race feelings among students….” Harvard’s board stopped short of instituting an official policy of quotas, but an unofficial practice of restricted admissions was adopted, and it soon spread to colleges and universities around the country. By the 1930s, about half of all applications to medical schools were coming from Jewish students, but only about 17% of those were accepted. When set against the proportion of Jews in the U.S., then about 3.5%, this number seemed fair to many of the day, including Jews. But the rejected students were complaining and resentment of the quotas—at that time an open secret—was growing. This was the situation when Rabbi Lazaron undertook his extensive investigation. Rabbi Lazaron wrote to the deans of 65 medical schools and received 57 responses. Rabbi Lazaron wrote to the deans, “I have felt for a number of years that too many of our Jewish students are going into medicine….Personally, I feel that we should not let this matter drift…and that it is the obligation of our Jewish people to attempt to divert, if possible, the increasing flow of Jewish students into this profession.” This is the source of Ellen’s question. Why divert them? How could there be “too many” Jewish doctors? Some colleagues and visitors to the exhibit theorized that Lazaron was showing understanding of the “problem” as a way of encouraging a more honest response from the schools. I believe, on the contrary, that Lazaron’s papers show he meant what he wrote. Another concern may have been the current climate of antisemitism. Hitler had been elected chancellor of Germany in 1933, and American Jews were fearful. In the end, Lazaron decided not to publish his findings, uncertain whether “it would be advisable at the present time to make [this] material a matter of public discussion” (emphasis added). Lazaron did not shrink from talking about being a Jew. 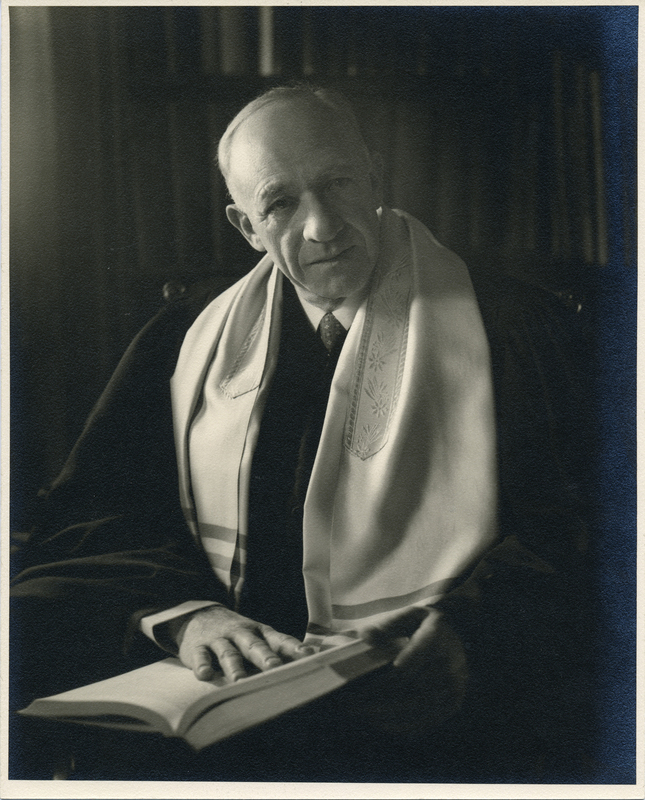 In fact, he was a leader in the National Conference of Christians and Jews (founded in 1928), and became nationally prominent in 1933 when he toured the country with Reverend Everett R. Clinchy, a Presbyterian minister, and Father John Ross, a Catholic priest, speaking to audiences about their beliefs and theological differences in an effort to dispel stereotypes. They became known as the “Tolerance Trio.” Lazaron saw his role in teaching Jewish students to cope with prejudice on campuses as particularly important, and while he was passionately committed to his Jewish identity and the right of Jews to worship in distinctive ways, he also sought integration and goodwill.